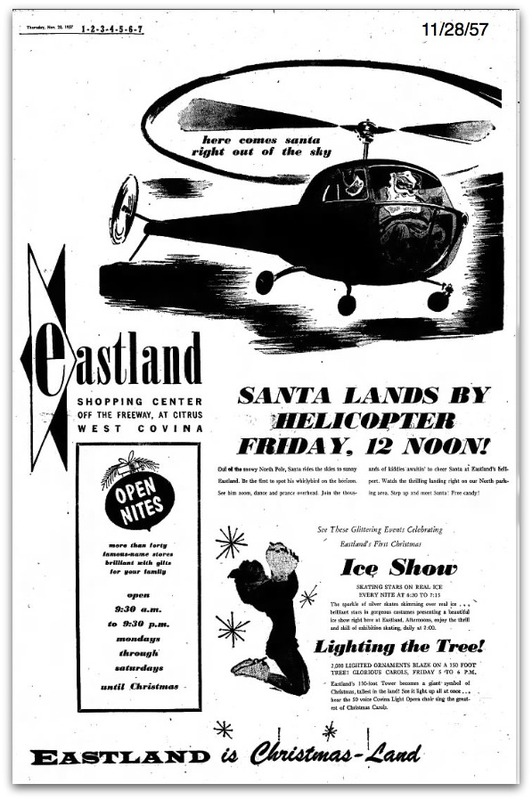 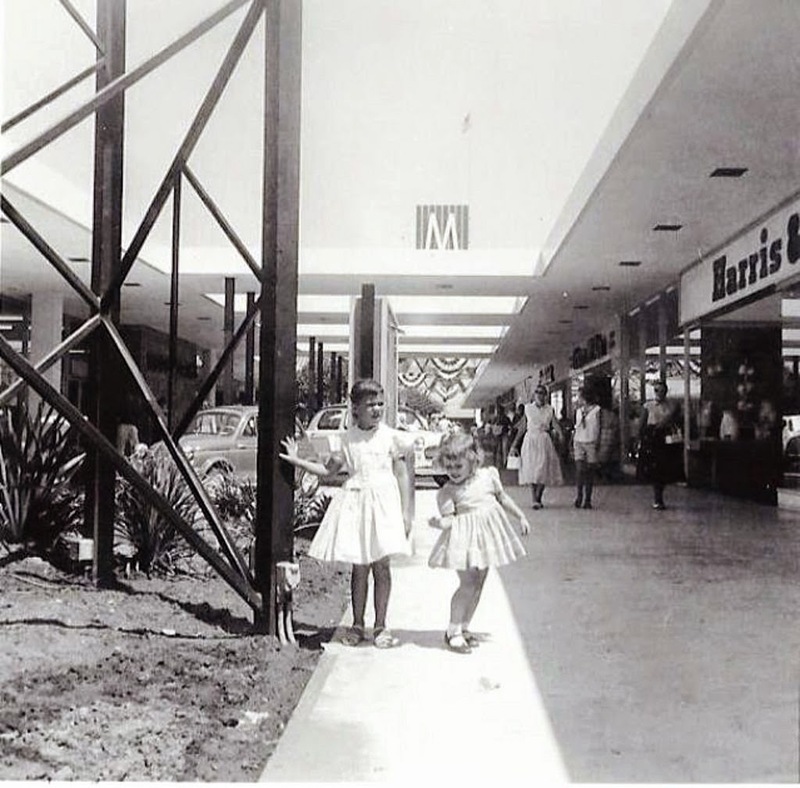 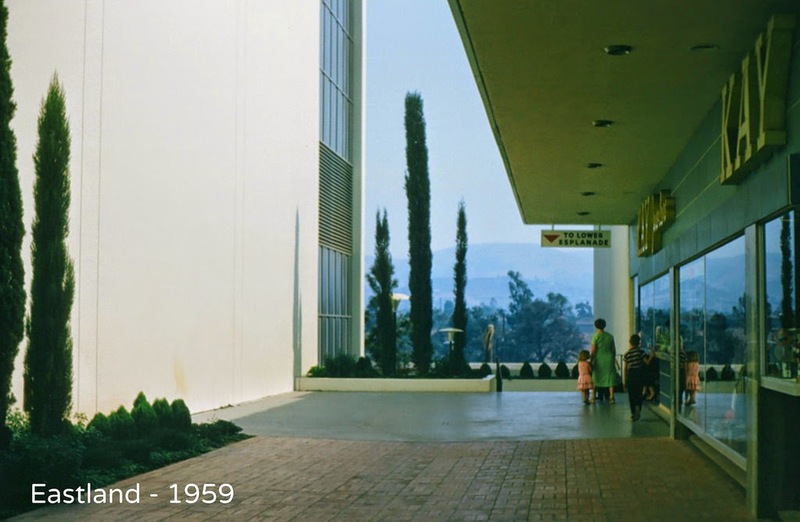 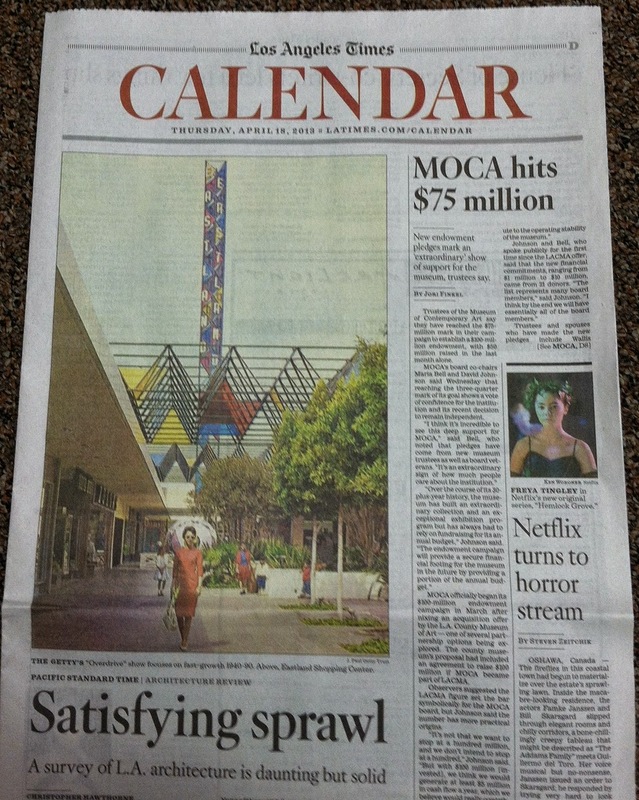 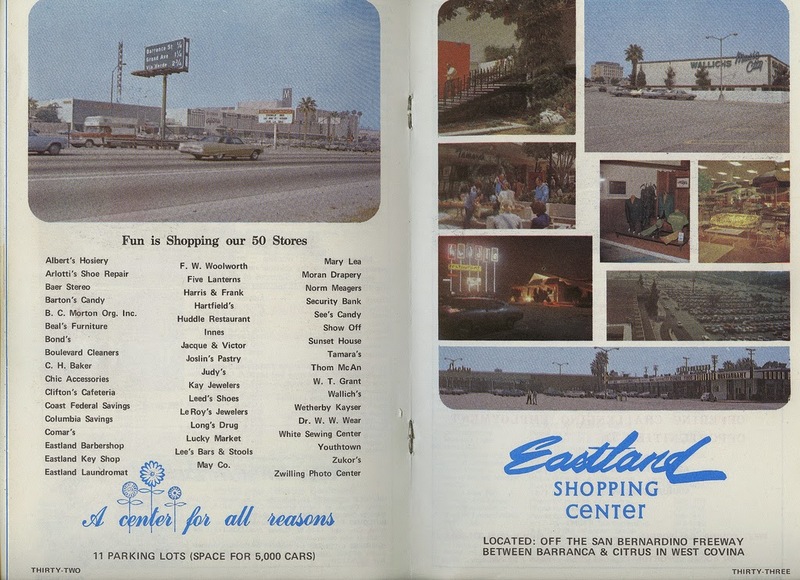 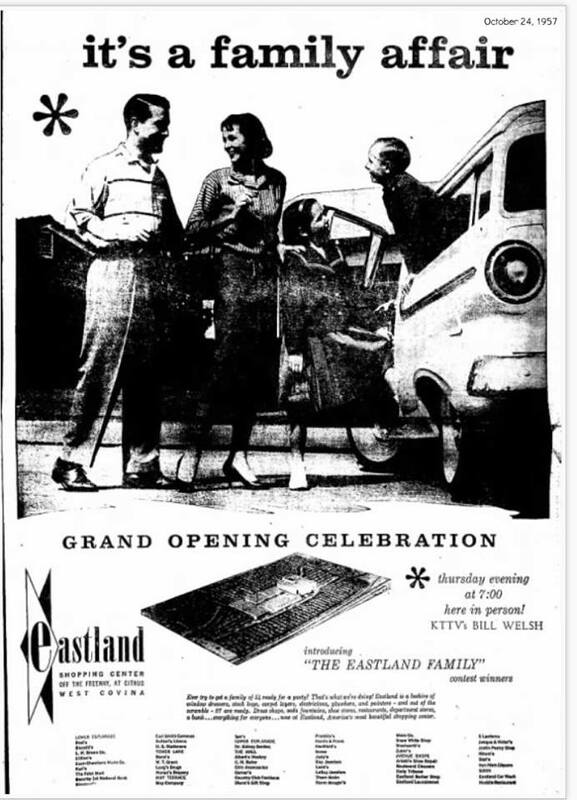 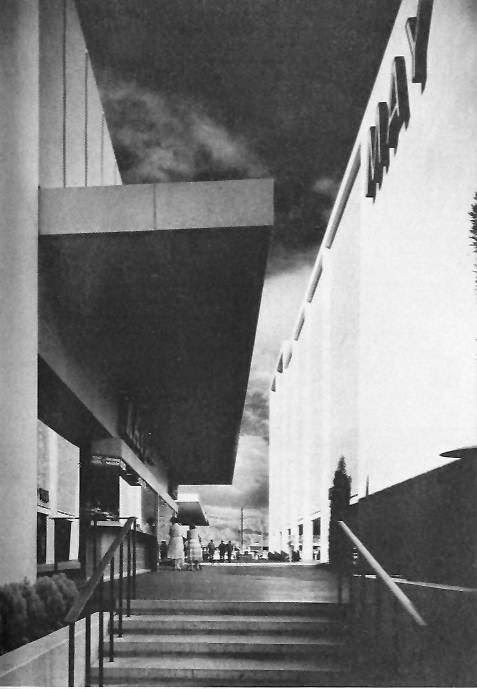 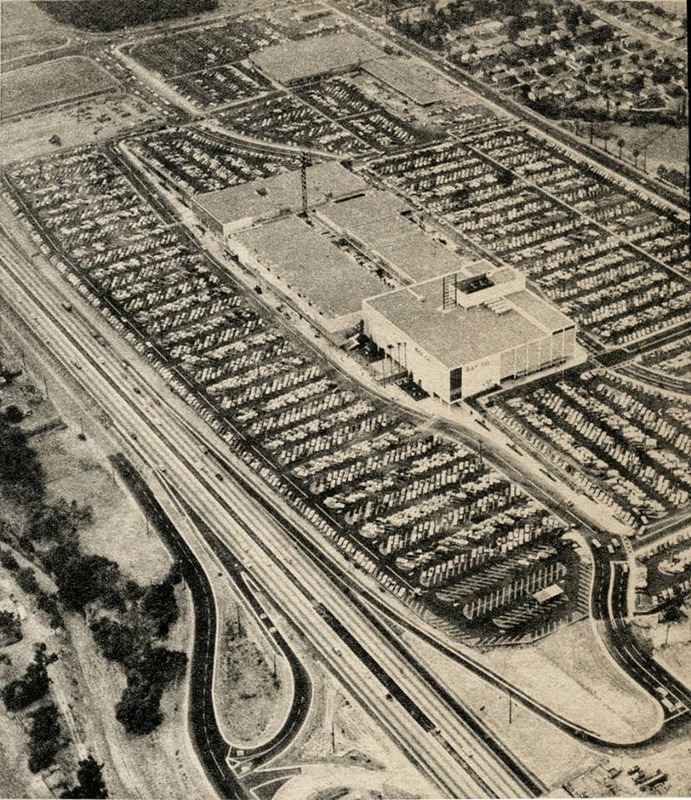 Eastland Center was designed by architect Albert C. Martin and opened in 1957 as an outdoor mall along the San Bernardino Freeway. 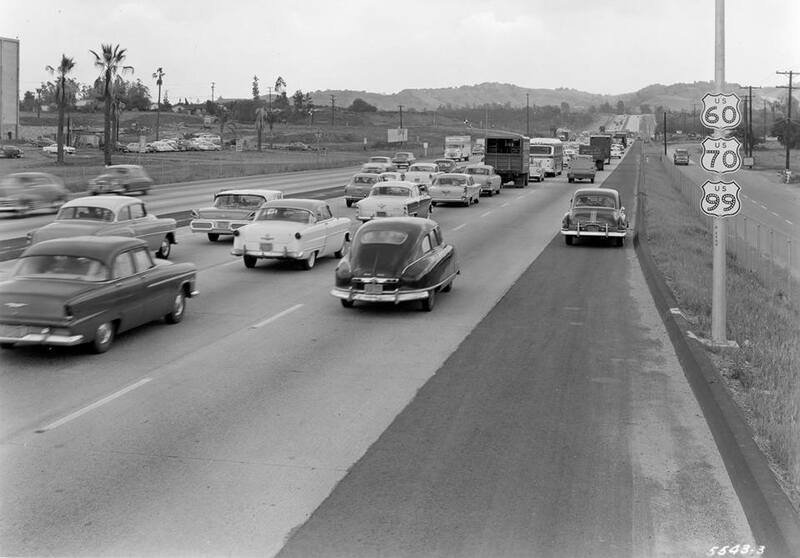 (U.S. Route 60 and U.S. Route 99, later Interstate 10). 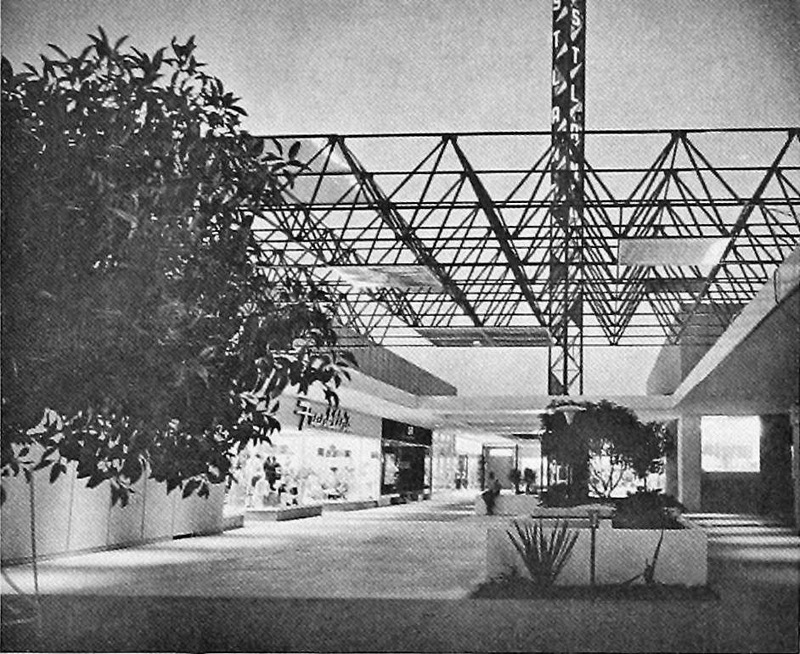 It opened with a 5-level MAY COMPANY on the east end of the mall, and 2-Level W. T. GRANT on the west end. 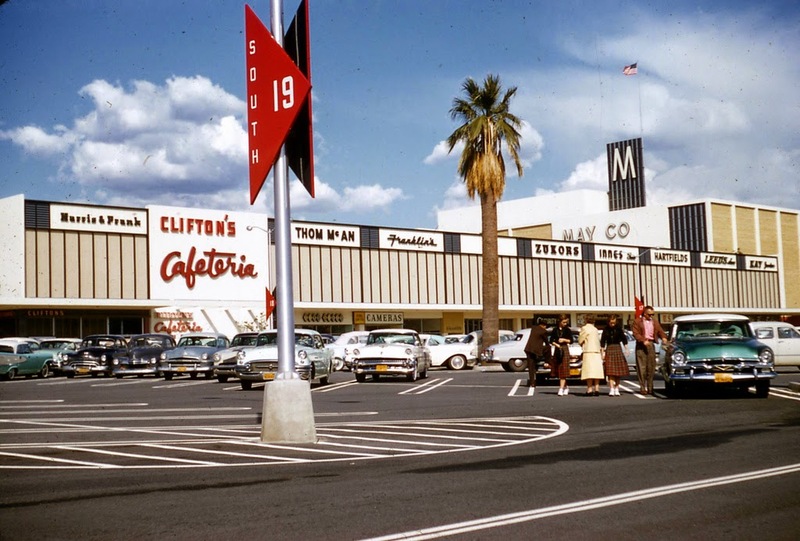 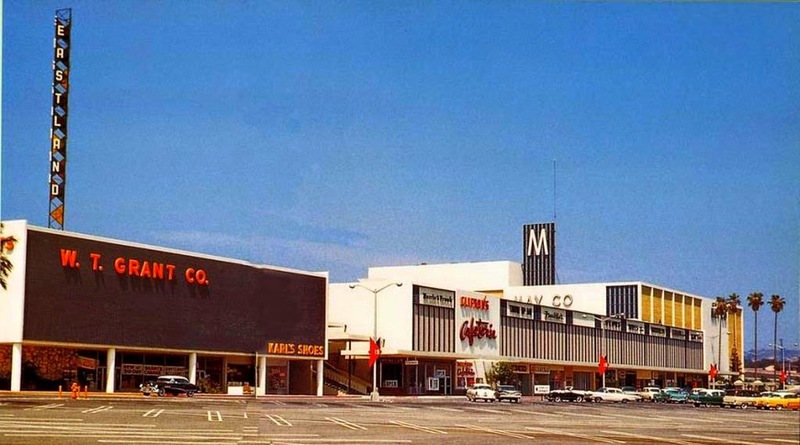 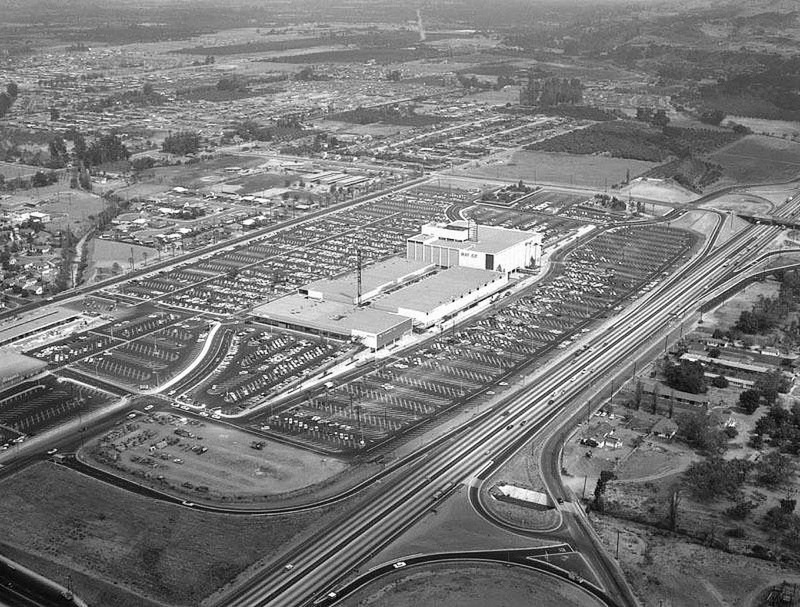 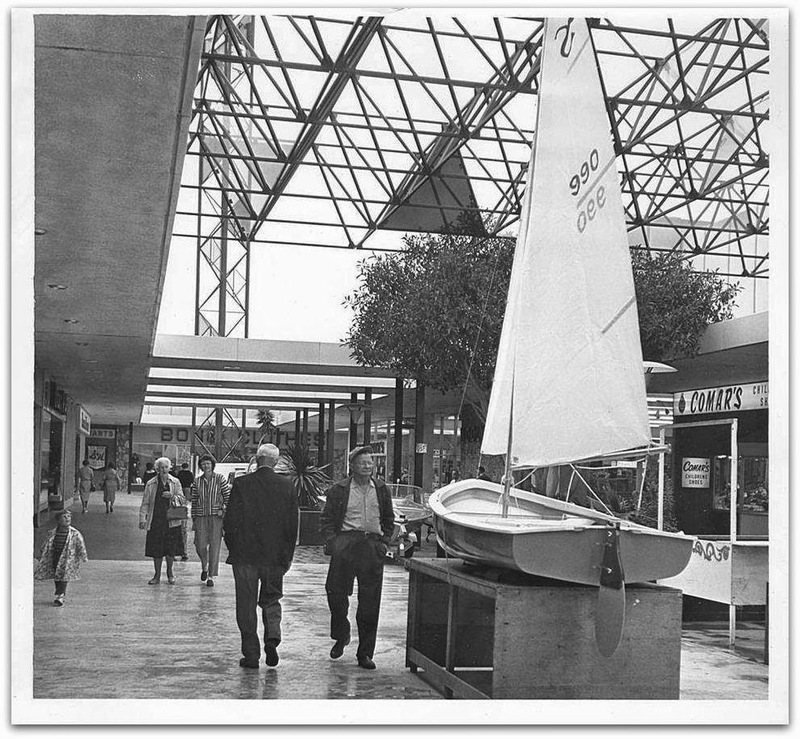 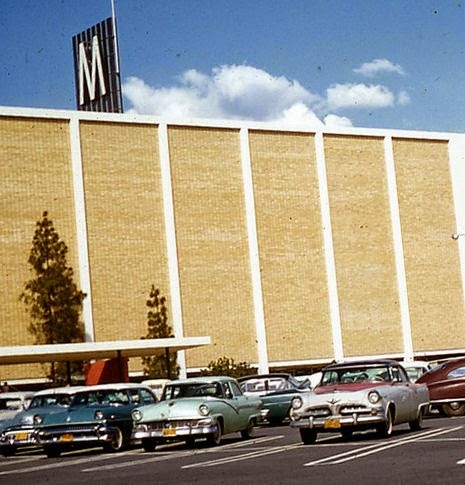 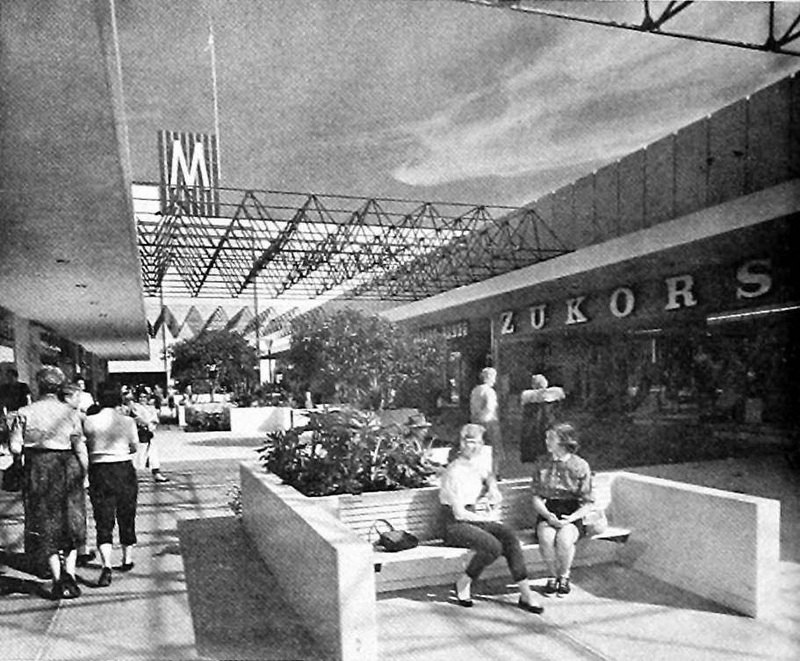 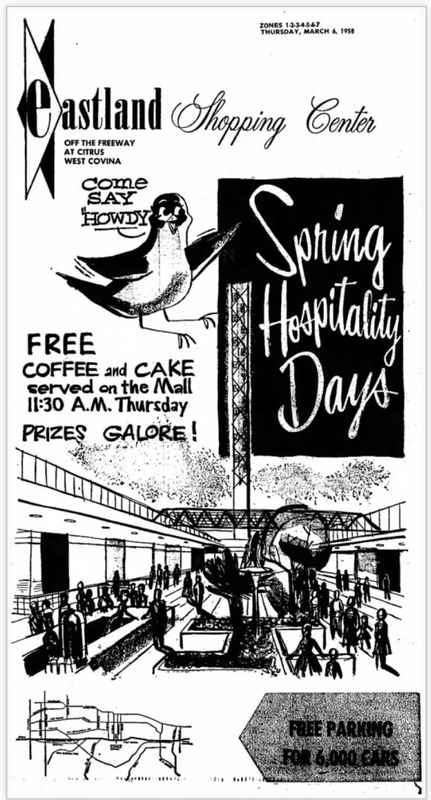 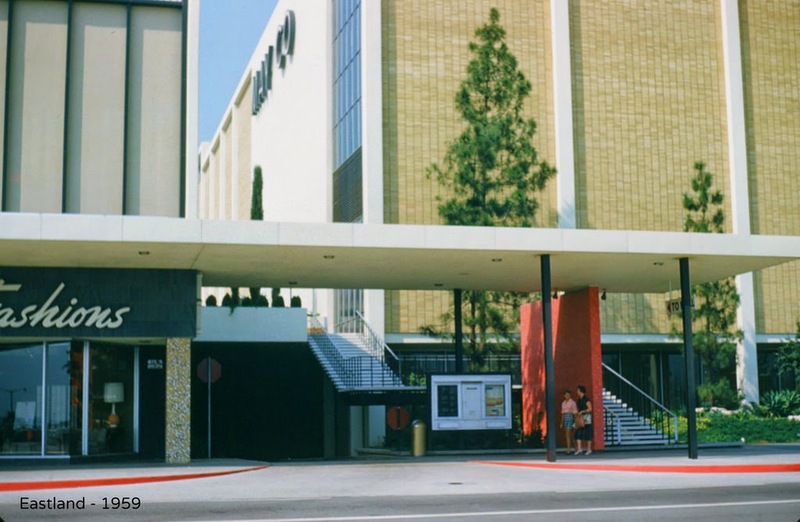 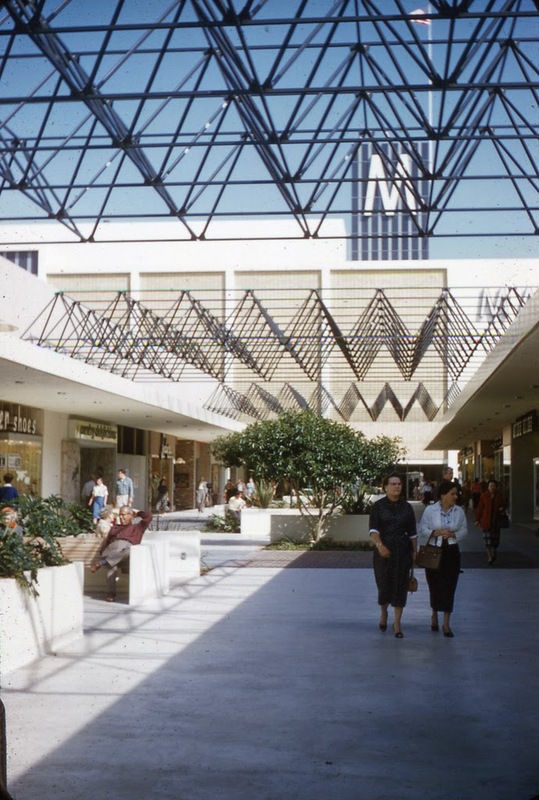 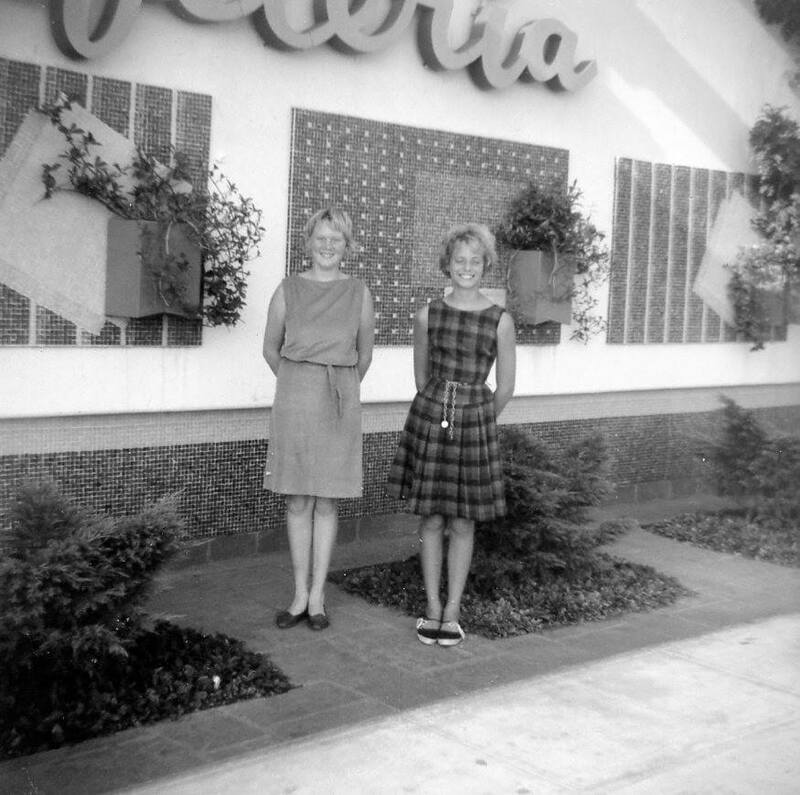 This mall was unique at the time, as it had a regular mall on the upper level, and a strip center on the lower level facing the freeway. 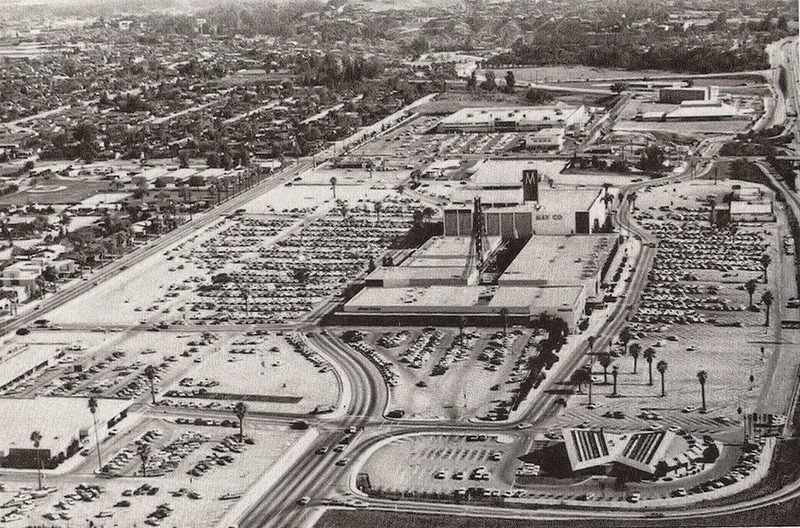 The Huddle restaurant chain had a location in the parking area where a TGIFridays now stands. 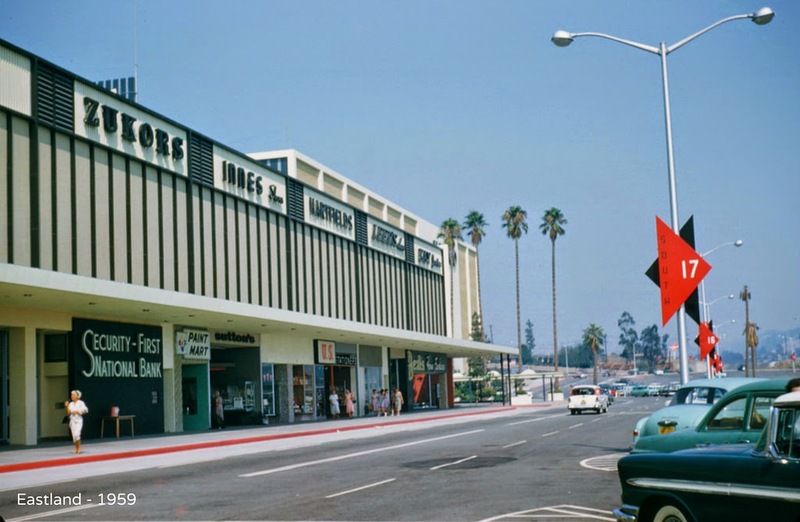 An outparcel structure, known as the Avenue Shops, was located in the northwest parking area and included a Hiram's Supermarket. 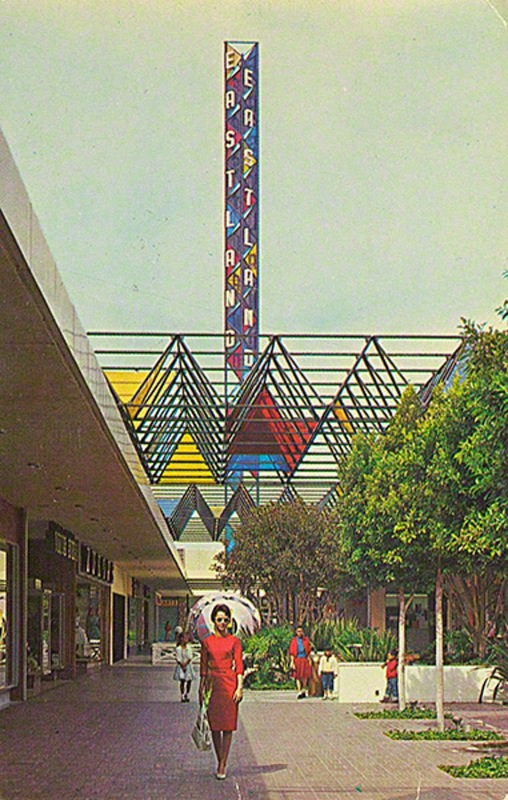 Special thanks for those who contributed to this this blog and video goes out to Dean Cheng, J. David Rogers, Jim Harris, Richard Pepe, Charles Phoenix, Los Angeles Public Library, Shorpy.com, Susan Peregoy, Gary Cliser, Arturo Salazar, J. Scott Shannon, West Covina Public Library, Greg Herbert, Randall Smith, Covina Argus Citizen, Los Angeles Times, Los Angeles Herald Examiner for the following photographs display on this blog. 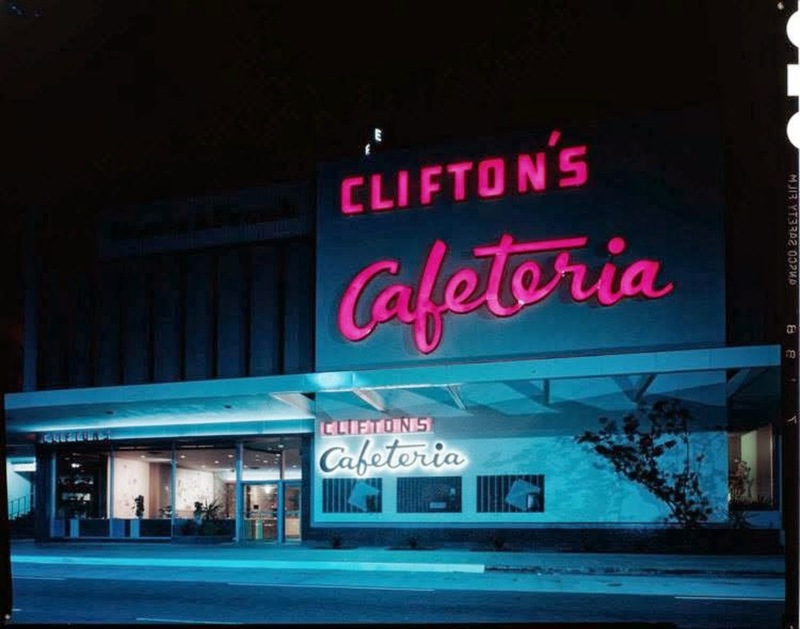 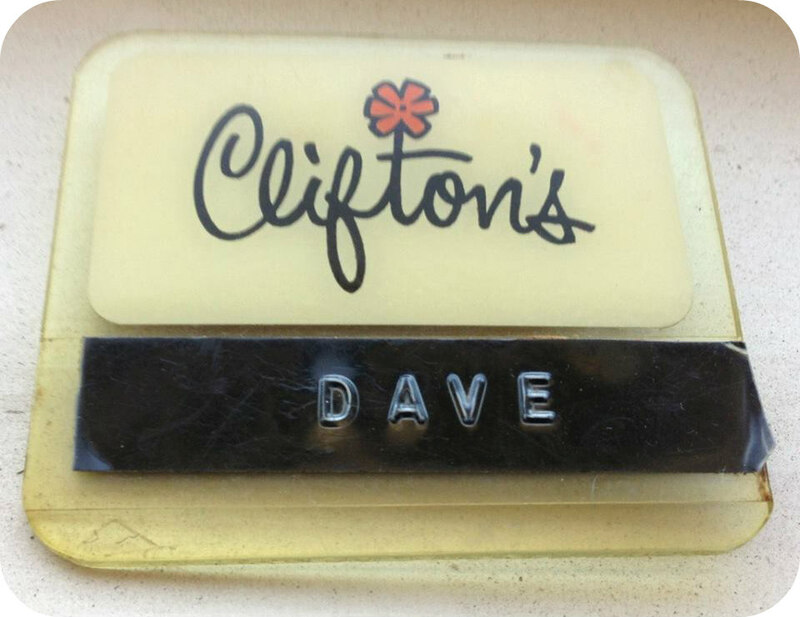 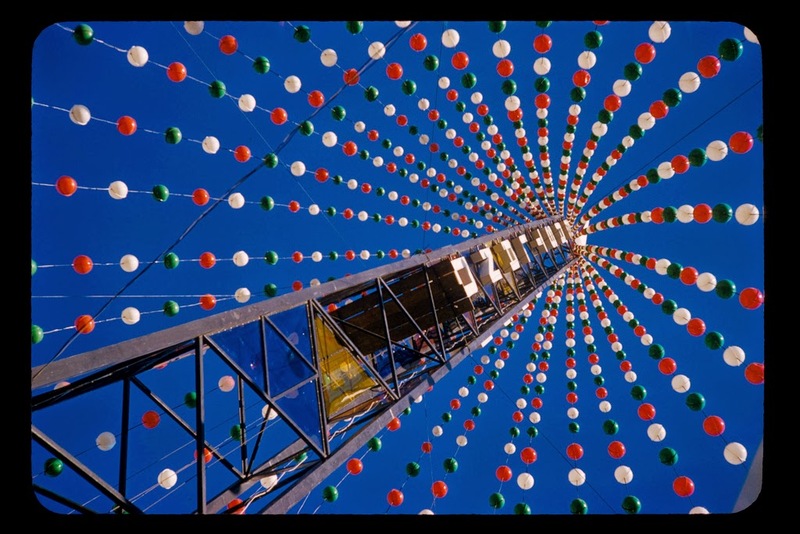 If anyone comes across any vintage photographs or color slides and would like to contribute to this site, please EMAIL us. 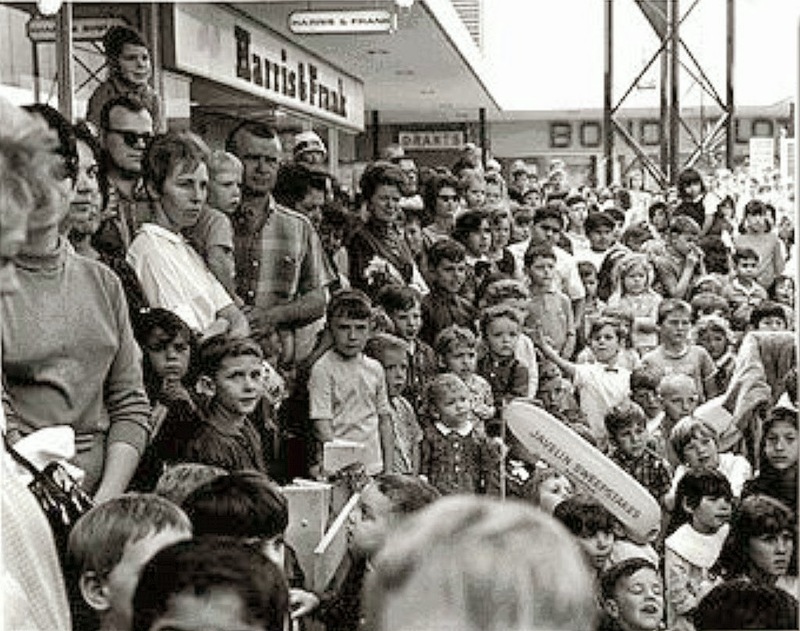 L/R, David May, V.P. 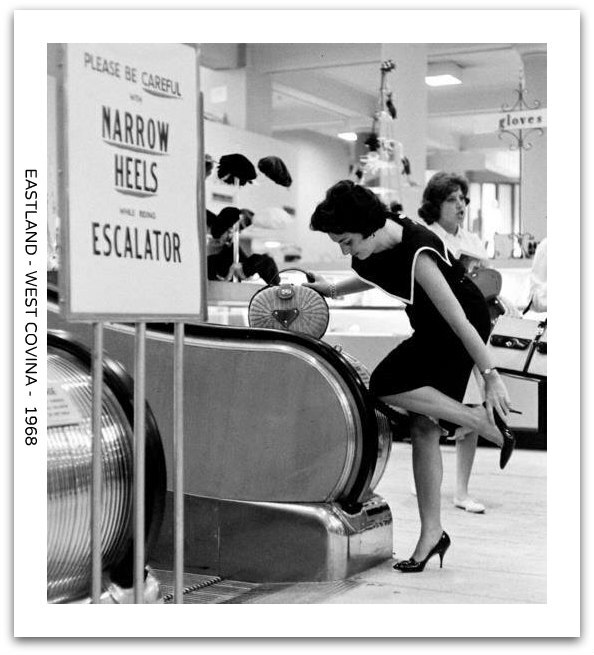 and dir. 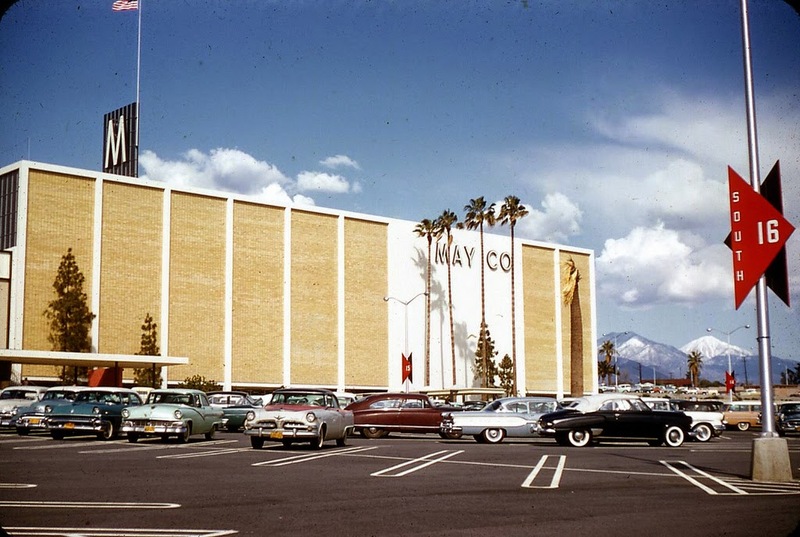 of May dept. 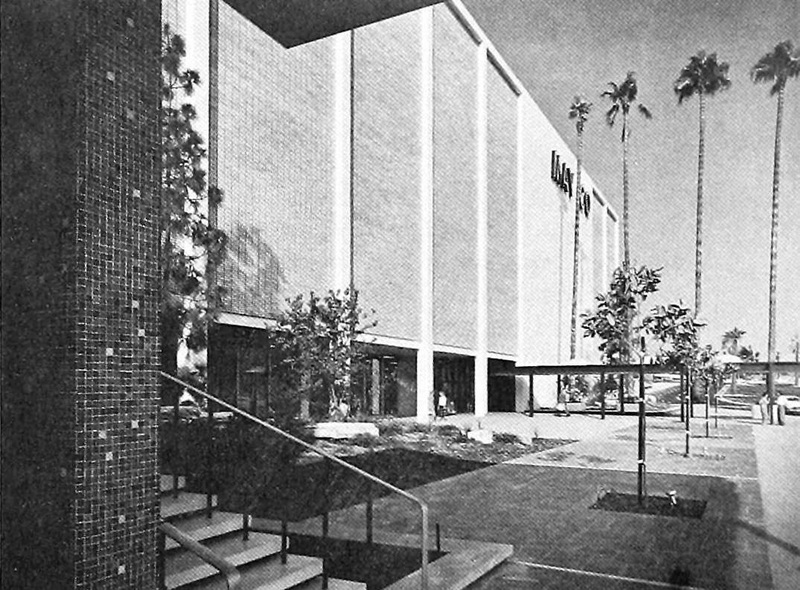 of stores; Tom May, executive v.p. 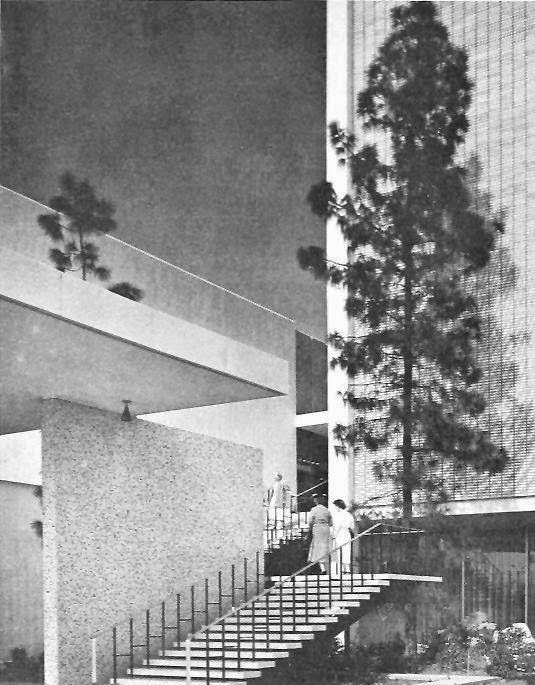 of May Co,; Joseph K. Eichenbaum, developer of project; Walter J. Brunmark, v.p. 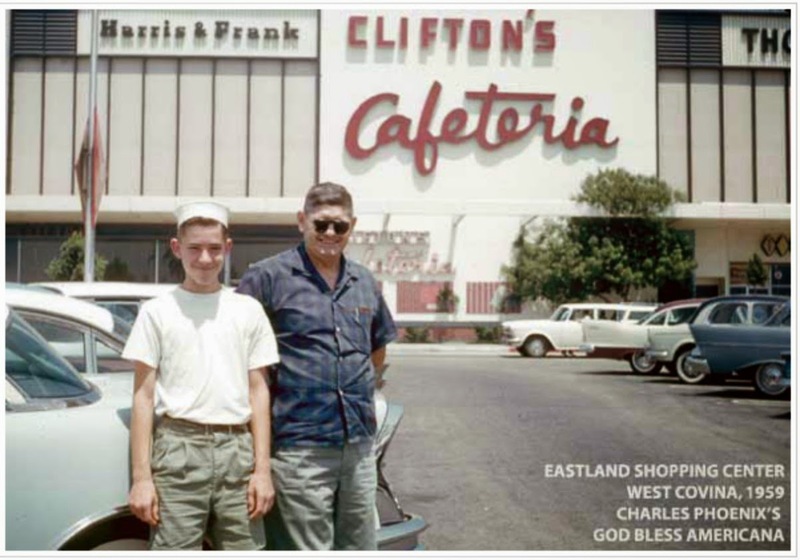 and gen. mgr. 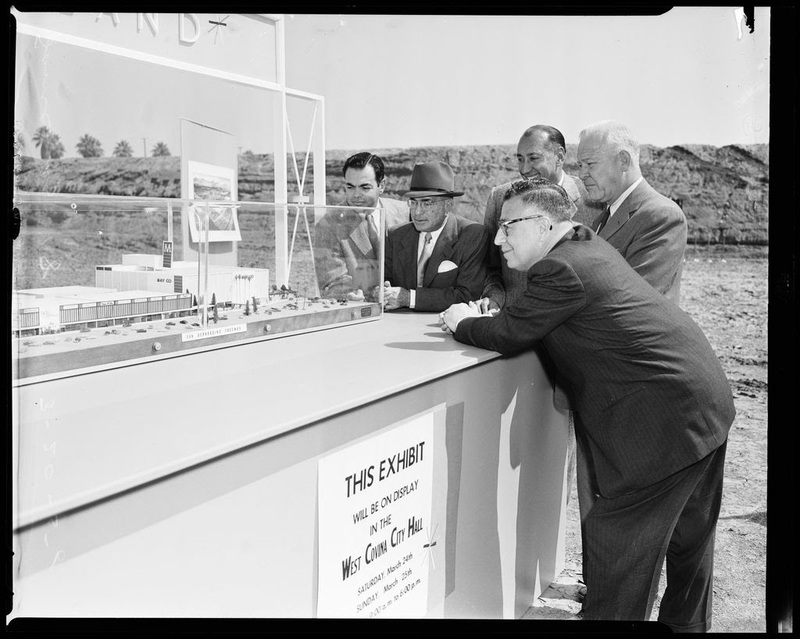 of May Co., L.A.; and Albert Rosenberg, gen. merchandising director of May Co., L.A.(foreground, bending over table) look at model of project. 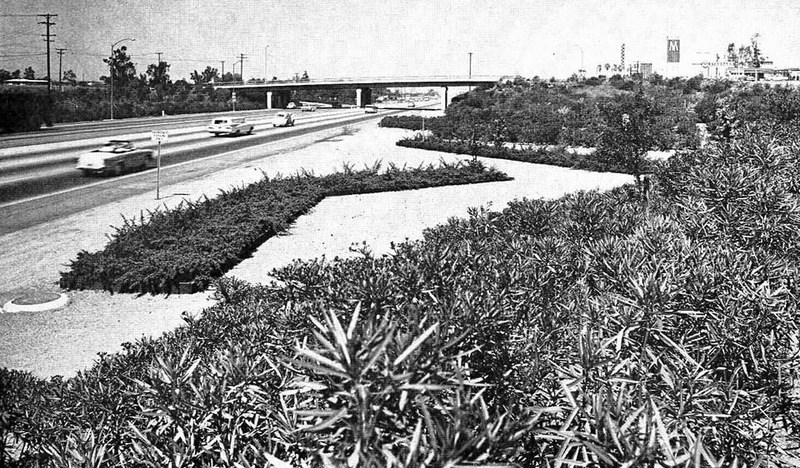 1961 - Elaborate landscaping along westbound San Bernardino Fwy (US-60-70-99) near Barranca St in West Covina. 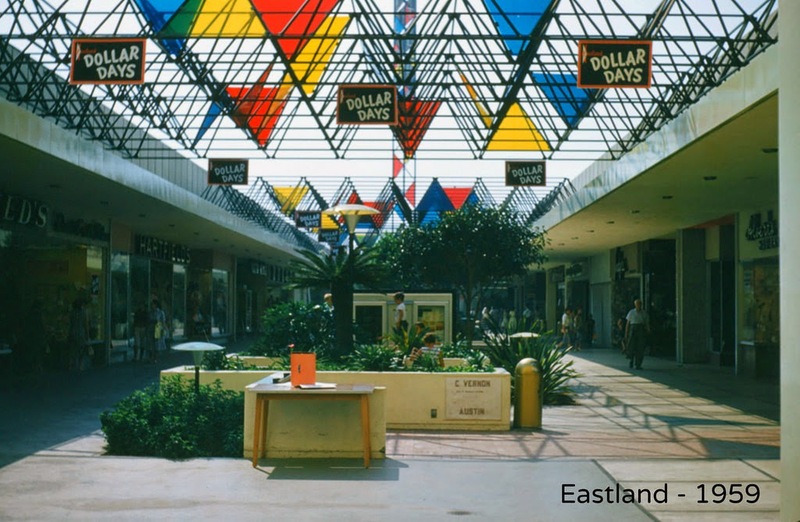 Eastland Shopping Center can be seen in distant right background. 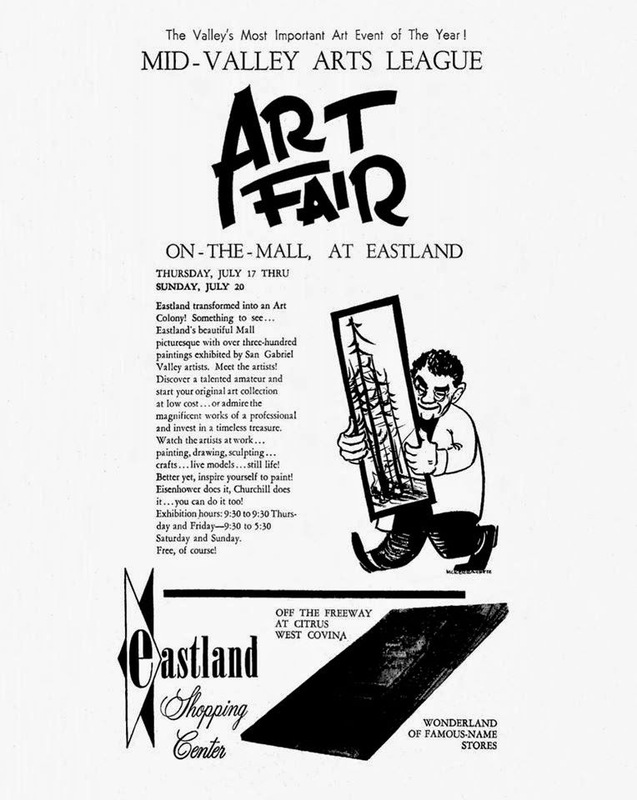 The open-air EASTLAND. 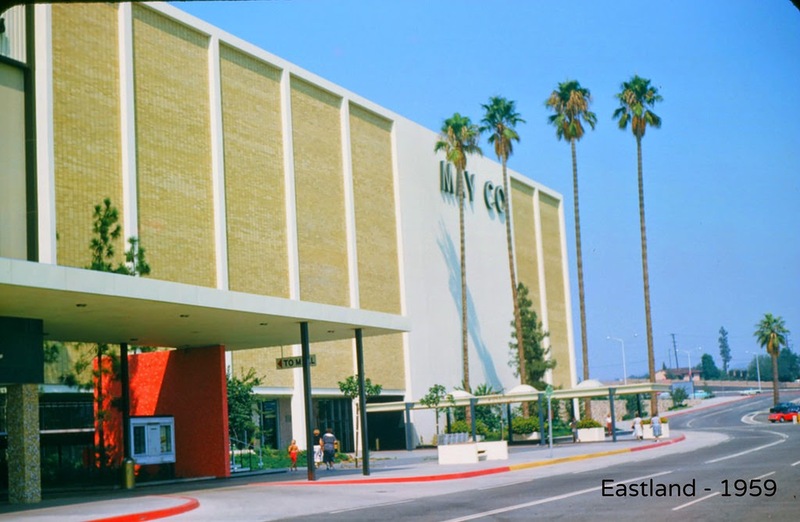 A tall tower, commemorating the mall, stood at the center of the west court area, which was referred to as "Tower Lane".On the east side of the center was the "May Terrace". 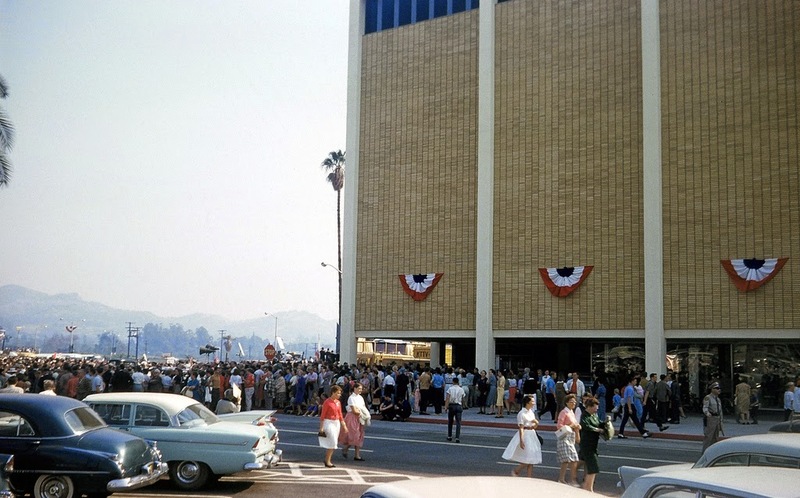 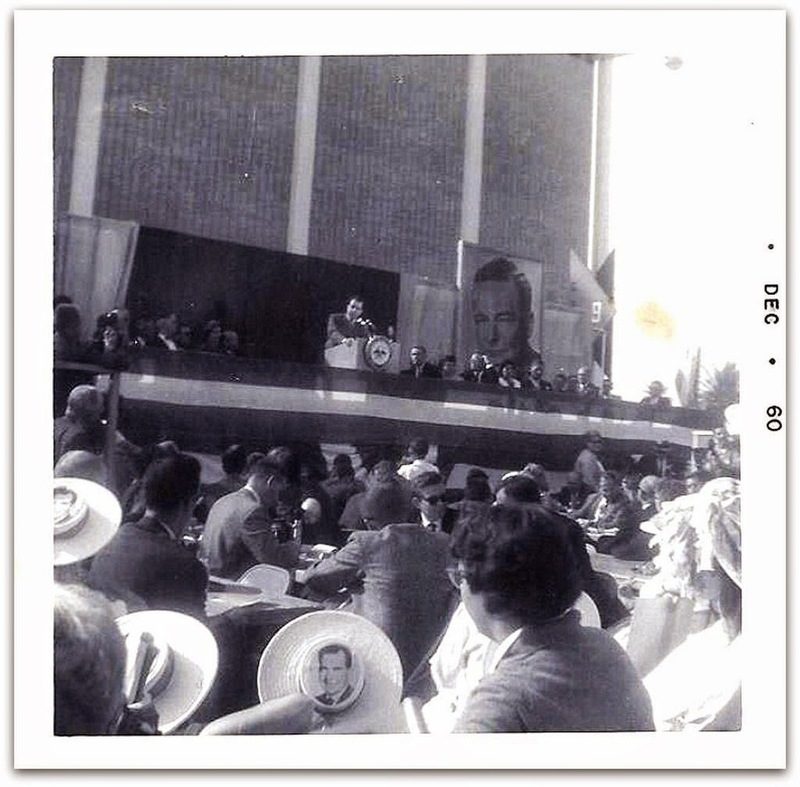 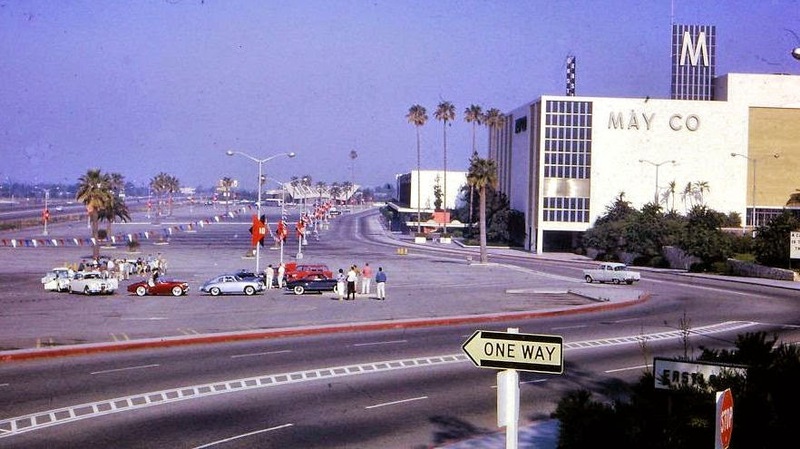 The lower level of the complex, opening on a lower parking area facing the San Bernardino Freeway, was called the "Lower Esplanade".